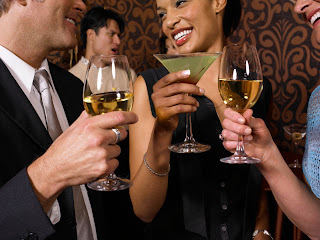 Many factors play into planning a successful cocktail party from the perfect decorations and tableware to assortment of drinks and appetizers. However, planning a great cocktail party is only half the battle! Making people enjoy themselves requires knowing how to be a good host. Here are some tips to improve your skills as a host and make your cocktail party memorable. We were always taught to be polite and it doesn’t stop here! It is really important to greet your guests the moment they arrive and make them feel welcome. Before showing them where the party is offer to take their coats and handbags or any belonging they might have. Once you’ve done so, introduce people. This will keep the party alive and it wouldn’t hurt to bring up a topic that might inspire a conversation. What better way to compliment your nicely decorated cocktail party than by dressing nicely. One of the most important tips is making sure your guests never have an empty drink. And this doesn’t always mean an alcoholic beverage. Make sure to walk around with a bottle to refill or water. Remember to monitor your guest’s alcohol intake. Smile at the party! Show your guests you’re having as just a good a time as they are. Nobody likes a “Debby Downer” so stay relaxed and talkative.